If you pick up a pan from any 00-05 L67 or L36 equipped Bonneville it will be a direct bolt on. The gasket is a potential. Some had a rubber inlaid gasket ($14) and some were simply gooped only. here's an inlaid gasket version. Here's one currently on Ebay that doesn't require the gasket. Thanks for the photo's and tip's on the oil pan. Bought the first one that doesn't require a gasket. With shipping cost it is half the price of a new tin one. GM has a sealant that you use to make the gasket. I forget the name, but any dealership should have it/and be able to tell you what it's called. Remember to pull the oil level sensor before you pull the pan and the same for reinstall. Otherwise it holds on the pickup tube. I think in the ad for this aluminum pan he included the GM sealant. It should be ready to install other than maybe cleaning it up a little and bead blast the alum to look new. Thanks for the advise on the level sensor also. There's a trail of broken parts behind each piece of good advice I offer. Thanks for saving me and others from the same fate. It's funny when you tell someone and they break it in half anyway. Had two buddies doing aluminum pans side by side with their kids at my place one day. I stressed what to do and why it was needed to both. One passed, one failed. If you are going to the NEP meet Sunday, you can meet the one that failed. We laughed for hours after I handed him a spare. What is NEP and where is going to be held. Would like to meet some fellow enthusiast's. How come you didn't mention you have an Alum. oil pan for sale before I bought the one on EBay.????????? I just noticed your list of parts that your bringing this Sunday to the meet. 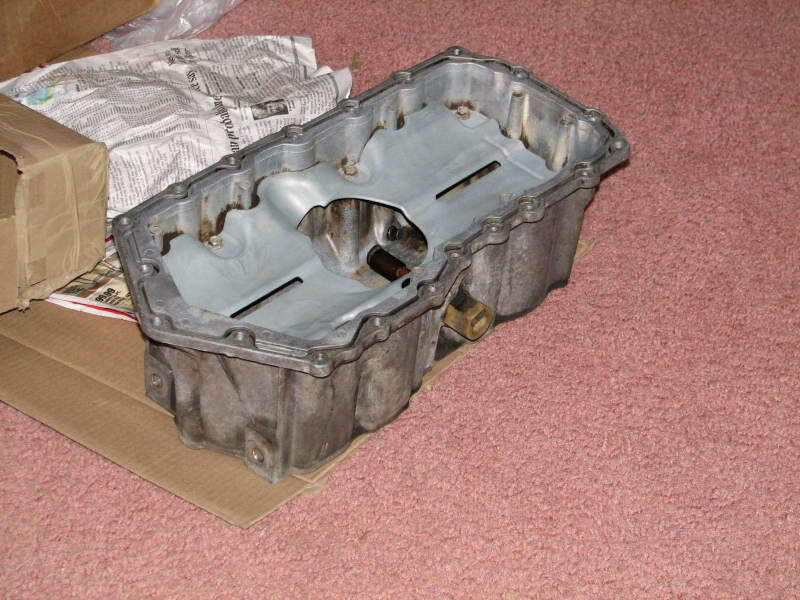 I picked up a used cast aluminum oil pan for the 3800, thanks to a tip from BillBoost, off Ebay last month. Instead of buying a new GM tin pan, which is what i was going to do, I got this solid aluminum one completely cleaned with a flat "gasket" surface. It doesn't require a gasket just sealant. This pan came ready to install with a new pick up tube, oil level sensor and a tube of GM sealant for $50.00 shipped. The new tin pan from monsterpartsonline.com was going to be just under $100.00 plus the cost of the gasket and shipping. I think this cast aluminum one will be the permanent fix to the leaking oil pan issue. I'll let you all know after install if it solves the persistent leak that I have been dealing with. I have no doubt that it will though. A very solid solution to the problem. yeah, i did my pan gasket without sealant, per the tsb and it is leaking same as ever...well, it did hold for about 3 weeks, but it is back, which leads me to believe thats what is leaking on mine. so much for the tsb. i should've used my original intuition and used sealant. i wonder if they make a cast pan for the series 1 engines, as i would like to probably do that as well. Is the Series 1 block different than the Series 2 ? If not, then the cast aluminum will work, I don't know for sure, maybe someone else on here knows. This replacement will solve the problem for good. I'm sure of it. It's a nice solid, heavy duty oil pan with a flat mating surface. So the sealing surface between the cast iron block and the "flat" cast alum. pan will work very good without the need for a gasket just sealant. There were some earlier cast aluminum pans that had a milled groove in the flat machined surface for a seal / gasket and from what I hear those leaked too because of the seal. They finally made this one with no provisions for a gasket and the problem's with leakage finally went away. what kind of vehicle did the cast pans come on? all i am finding are the steel pans. The Ebay auction stated it fit 95-2008 3.8 liter engines. I'm not sure exactly what year engine this one was off of. You might want to try PM to BillBoost, he's the one that forwarded the link to the auction site to me. He's more knowledgeable about what fit's what. As I mentioned in a previous post I have since been told that there is some years that used cast aluminum with a groove for an o-ring type seal and later they went with this type that is just a flat machined surface to be used with sealant only. I believe this type is the better of the two. Take a look at this link. It is the original link I bought from and has a very good description of what the pan fits and what year vehicles it came standard on. Take a look at it and see if it helps. Got that Aluminum oil pan and finally got around to installing it today, came with a new tube of GM sealant, oil pick up tube and oil level sensor. Received it all cleaned and ready for install, very good deal. Installed it today and noticed another benefit, it added almost another quart of oil capacity. Very good fix for my leak problem. 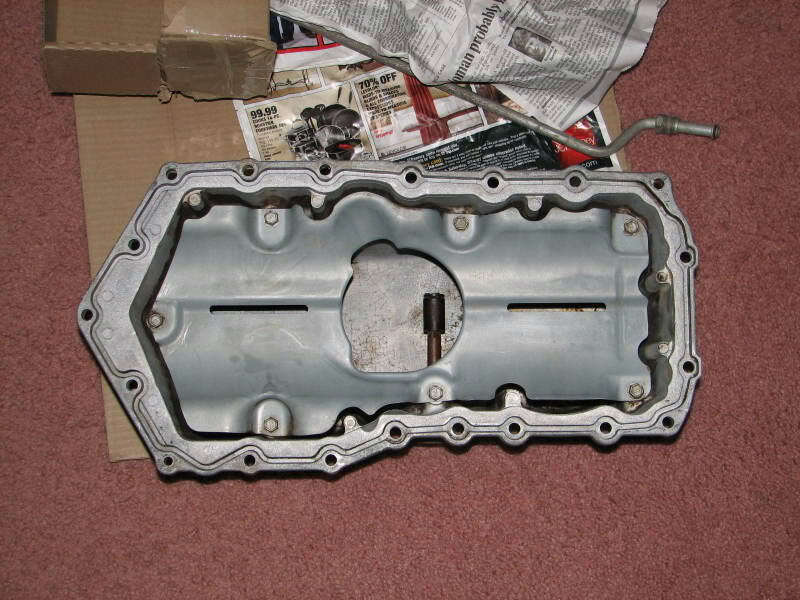 Total cost with shipping was $50.00, that's the same price i paid for my last oil pan gasket. Very good deal. Make sure if you get one used that you get the oil pick up tube with it, as it is different than the original. The Alum. pan has the oil deflector (windage tray) built into the pan, where the original uses the oil pan gasket as the deflector, and requires the different oil pick up tube. Other than that straight forward install. It's a very heavy duty cast oil pan. Well made. The Alum. pan has the oil deflector built into the pan, where the original uses the oil pan gasket as the deflector, and requires the different oil pick up tube. Other than that straight forward install. It's a very heavy duty cast oil pan. Well made. Did you have to remove anything besides the oil pan to get to the gasket? Doesn't something else need to be removed in order to drop the oil pan? Seems I read that quite a while back, can't find it now though. After draining the oil, remove the oil level sensor from the pan before removing the oil pan, otherwise it will get hung up on the oil pick up tube inside the pan. Travis, nothing else has to be removed to remove the pan and gasket. Also, now that I've sealed up my oil seepage problem i think i will switch to using synthetic oil. I had been hesitant before because of leakage. Ok, thanks Rick. For some reason I thought something was physically in the way of dropping the oil pan. Or maybe that is related to the trans pan? I'd like to change to this pan also, but don't see any currently listed anywhere. My stock pan is a bit beat up, and seeping, but not dripping yet. Update on cast aluminum oil pan installation. I have 3,000 miles on the install now and just did my first oil change since installing the alum. pan. No leaks, seeping or drips. Dipstick read full before dropping the old oil out. Engine is nice and tight. Now that I'm leak free I think next oil change I'm going to try synthetic oil.